Rated 5 out of 5 by sarij88 from Loved It! Been away from BFG for a while, and this is the first game I chose to play. Man the graphics were splendid, and the storyline really had you going. However, it did feel a bit of a drag to keep having to go back to each place you visited. All in all a great game, the ending even gives them a chance for a fourth game in the series.... Can't wait. Rated 5 out of 5 by doorgirl from Imaginative I love in this style of graphic that revels in its drawn 2-D quality like a very good storybook. The mini-games have an extra bit of effort in their construction and have a choice to do the HO or a matching game. The voice-overs are very good. The developers have given that extra effort that makes a difference. Rated 5 out of 5 by pmanuel from Good sequel to the first game The introduction brings you right back into the storyline and it's a good trial after that. Will certainly add to my collection. Rated 5 out of 5 by cherleadford from Very Good Game Played all the demo and really enjoyed it. The graphics are very good and really liked the voice overs. The story line is stuck to real well. Map is easy to use and like the HOS/ Puzzle games. The hint button fills quickly. The Imp is cute except for his eyes, they look kind of evil. This game I will buy in the CE. Rated 5 out of 5 by belamba from Love it.... Really loving this game. Nice touch being able to customise the way you play eg no sparkles, quick fill hint and skip features. Plenty of morphing objects and other collectables. Graphics are fabulous, and the map (thankfully it has one) is very useful at taking you to various scenes with objectives. Only halfway through bonus chapter, and really don't want game to end. Not many games keep me wanting to play to the end, but this is one of them! Real quality, and devs have put a lot of work into it. HOS are easy ish, and you can choose a matching game instead if you prefer. Puzzles are well thought out, although rather too many 'circle' puzzles which get a tad boring. But, all in all well worthy of a CE and if all games were like this I'd be stony broke! Rated 5 out of 5 by pennmom36 from HOG HEAVAN! 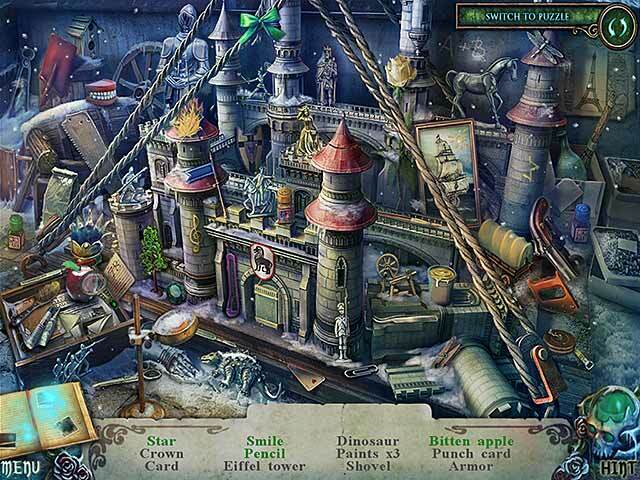 That's right hidden object puzzle adventurers this is a superior game with a great story that ties into the previous Witch's Legacy yet stands well on it's own to allow those who haven't played the other game to enjoy this one. The graphics are crisp and the voiceovers well done and there are 4 settings to choose from including a custom setting to opt for sparkles or how long the hint button recharges, and that's just the beginning! At the start of the game you will find and name a tiny little imp that will help you during the game but don't worry you don't have to dress him but you will earn achievements for interacting with him as well as using him to complete 11 different quests. To all you morphing object fans (myself included) there are a whopping 42 very well done morphs to find some of which are in the zoomed in areas so pay attention. To all the fans of collectables you will find 45 puzzle pieces which will be used in the bonus AND if you don't find them all the first time around you can replay the game and just search for the puzzle pieces, how cool is that! 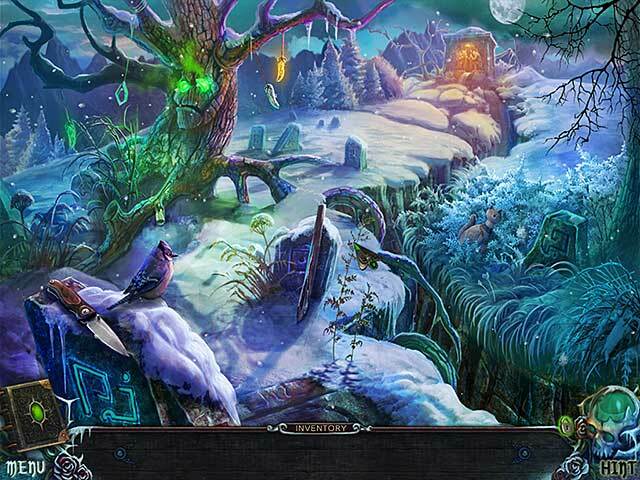 There are 27 hidden object scenes and they are interactive or you can opt to switch to a matching game instead. There are 29 mini games to play and so far none of them are too difficult and most are fun. You will also get an achievement for overcoming 5 different magical objects such as getting through a door that has been sealed with magic. As I said before this game is chock full of extras there is no way you won't like this game and the CE has wallpapers, screensavers bonus play and puzzles so stop reading and download the game, enjoy! Rated 5 out of 5 by Rudygeegee from Another Great Multi-Task Game! This review is based on the CE DEMO played on NORMAL.. Wow, what a game. So much to do, and the game should satisfy everyone. You have a Main Chapter and then the Bonus Chapter will unlock. 4 difficulty levels: Casual, Normal, Hard and Custom. You can change the difficulty at any time. Cut scenes can be skipped. You can speed through the dialogue. After starting the game, you will earn a map that shows you location, and you can jump to locations you have already visited. You have an IMP friend to help you, and you will have a diary to keep your notes. Graphics are crisp. You can play either HOS or switch to a match game. 42 Beyond Morphing Characters 45 Jigsaw pieces to find Acheivements! 5 Magical objects (Steeplechase) 27 Complete puzzles without a hint 11 Interacting with your Imp friend 10 Quests with your Imp friend Quick Witted - solve mini puzzles without skipping An excellent game! I give it 4.5 stars, rounded up to 5! Rated 5 out of 5 by nuttyfisherwoman from loved it Only 22 minutes in and I bought this game. Loved morphing objects puzzle pieces and all the other bells and whistles. HO's were not too hard or too dark as had been the case with the last couple of games. Rated 5 out of 5 by MSBAM100 from Lynn grows up This is a continuation of the first Witches Legacy game, which is recapped via cut scenes in the first few minutes of the game. Elizabeth the witch, who killed Lynn's entire family so Lynn could be her heir, has reappeared in Rothenburg. You are Lynn's guardian, and realize she has begun to grow into her magical powers. Lynn decides to chase after Elizabeth to exact revenge, and opens a portal to Rothenburg. You must follow, but you don't have magic powers! This is a great sequel, with everything you can think of -- four game choices, from Casual to Custom, an interactive map, a journal, a quickly refilling hint. Plus 42 morphing objects and 45 jigsaw pieces to find. And a little imp helper who can reach places you cannot. The HOS scenes are bright throughout, even on large monitors. An interesting switch is the ability to move from the HOS list to a matching game that lets you substitute 2 matches for a "found item". The mini-games are not too easy, and many are unique. There is, of course, a bonus game and a strategy guide included with the CE. Finished the demo -- off to buy it! Rated 5 out of 5 by bigfishyfan44 from AWESOME I REALLY LIKED THE GAME AND HO ASPECT TOO. CHALLENGING PLUS SOME INTRIGUE TO IT. Rated 5 out of 5 by gamefaerie57 from witches legacy:Lair of the witch queen I just finished the trial,this game is entertaining. There is a cute little Imp friend that helps you along the way. there are morphing objects love those! jigsaw pieces you accumulate,the music fits the atmosphere.The story is a familiar one,family member is enchanted by a beautiful witch then disappears,but the trial really pulled me in and I will definitely buy the full version. Thanks Big Fish for another entertaining game,because that's what its all about ENTERTAINMENT! Rated 5 out of 5 by neilskinut from This is just as good as there first game. Very well put together game. The music is good. Has voice over and the graphic are clear and good. Well done game. Good story all the way to the end. The HOS are good and not hard. Some are interactive. The puzzles are some hard and some not. Some new and some like you have seen before but still good. There are items to find like all the games today. Has a pretty good flow and keep you wanting to keep going. Rated 5 out of 5 by petalpetal from One of the very best. I was fortunate to beta test this game, and I have been on the edge of my seat waiting for the full release. This game has it all. Great storyline, fantastic puzzles, HOS, visuals to drool over and music that really suits the game. I am in game heaven with this one. Couldn't recommend it higher. Rated 5 out of 5 by Nilosh from Great Sequel! In the previous game, we saved Lynn from the evil Witch Elizabeth, who had killed off the entire family so that she could get access to Lynn's powers. Our story continues and as gaurdian and protector, we realize that Lynn's powers are beginning to awaken and it seems that Elizabeth is once again back in the picture and so our adventure begins. 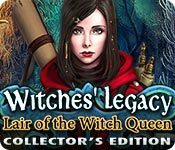 With wonderful graphics, well animated voice-overs and beautiful artwork, Witches' Legacy offers a somewhat challenging HOPA with many extras to keep it entertainig. Main menu offer three choice of game play with the option to customize which I prefer. Game features a journal along with a map that will alow you to travel to areas of interest. Also in the mix is an adorable sidekick, the little imp that helps us with certain hard to reach tasks; I named mine Trix. The extras I mentionned earlier are a series achievements that include several tasks such as interacting with your imp throughout the game, finding morphing objects in every scene and locating all 42 pieces of a puzzle. Hidden Object scenes are somewhat junk-piled and interactive, but you do have the option of switching over to a mini-game which requires you to find matching pairs. 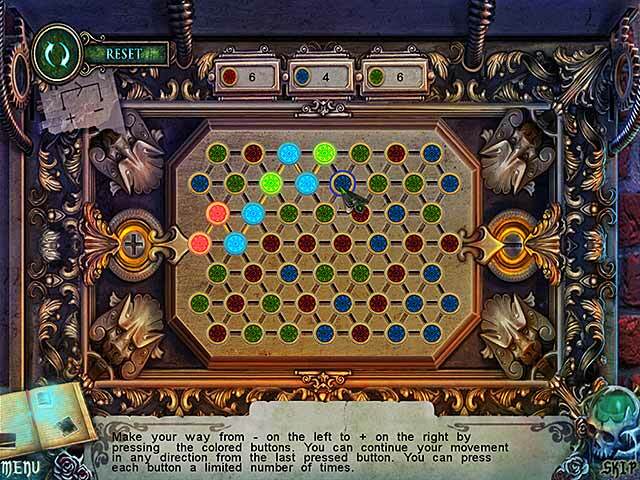 To add to all this, there are a variety of mini-games throughout the game that are well executed and offers some challenge to the game. Throughout the demo, there wasn't anything I did not like about the story; a touch of suspense and intrigue that draws us into the plot. I liked the characters and enjoyed the adventure. A great game to add to one's collection and an excellent sequel. Bravo to the developers and thank you BFG for starting off our week-end with a touch of magic. Rated 5 out of 5 by taigood from Pure entertainment I'm not going to get into the details of this game because those you can get by playing the demo. And you SHOULD play the demo and get your own point of view, because as far as I'm concerned this is not only an excellent game, it's PURE ENTERTAINMENT. Congrats to these devs for creating a game well balanced to appeal to most gamers. So far, one of the best of this year. Rated 5 out of 5 by quizzly from Great game, great challenge I had to tear myself away from the demo to give a first impression: You can customize the difficulty level, you have the option to search for hidden objects or play a match two game, you have morphing objects, and more fun stuff is really crying out to go back to playing, and that is what I will do now! Rated 5 out of 5 by rosekaufmann from WHAT A COOL GAME! A MUST BUY! Refreshingly different. This game seems to have everything: a very compelling story, 42 morphing objects, an enchanting pet imp (who was a pet dog in a previous life), custom settings where you choose the speed of hint recharge and skip ability as well as whether to have sparkles or a HOS click penalty. Simply gorgeous graphics, a fair number of achievements (including imp-sitting and imp-using to help with your quests), nicely detailed HOS and fabulous gameplay. Great pace. A good variety of puzzles. Can't think of any negatives, except that it can't possibly be long enough. The CE has enough to offer beyond a SE that the CE is a definite buy. Rated 4 out of 5 by Anouymous from Good game! Very good visuals and sound quality was excellent. Story was good. Rated 4 out of 5 by hermitcave from The saga continues when Lynn gets a lead on Elisabeth The lead-in cutscene explains the happenings during and after the first game - Charleston Curse. After saving Lynn, the two of you have grown closer and she has become your ward. But lately, she has become withdrawn and you fear she is becoming aware of her potential as a witch and will want to explore that some more. Lynn receives a letter from a woman named Morgana, who is aware of the situation with Elisabeth [the witch who tried to kill her] and that she has seen her in Rothenburg, Germany. Lynn's thirst for revenge causes her to use magic to create a portal to travel there. Being worried and responsible for her safety, you also travel there to find Lynn looking for Morgana's house. Lynn is not happy and tries to prevent you from following her. As you search for Lynn, you learn that Morgana has tricked Lynn to get her to come there and that she is really the Witch Queen. Years ago, Morgana had tricked a witch hunter, Wolfgang, into marrying her so she could get to his sister, Elisabeth, and turn her into a witch. She killed Wolfgang and susceeded in turning Elisabeth who used the same ruse at Charleston Manor when she tried to turn Lynn. There is the usual journal that keeps track of clues and story, an interactive map that you acquire once you reach Rothenburg that shows locations of sites with actions available, background sounds appropriate for the scene, intermittent music that was pleasant, and an inventory that locks. Graphics, animation and cutscenes were very well done with dialog displayed at the bottom of the screen that you click on to continue. I especially liked the animated door knob with a cold. You find an imp helper that apparently was Lynn's dog that died and was turned into the imp by Elisabeth so she would have a companion. The imp helps to retrieve things during the game. HOS are interactive list types that are well drawn with most items visible but some are well blended. There are the usual achievements, 42 morphing objects and 45 puzzle pieces to find. Some are very hard to see, especially some of the puzzle pieces that don't even look like puzzle pieces. I did enjoy the game and story and I thought the ending was appropriate with you convincing Lynn not to kill Elisabeth which angers Morgana and sets it up for the next sequel. The bonus chapter involves Lynn wanting to destroy the magic mirrors Morgana uses as portals before you both return home. I don't think it added that much except to flesh out a little more of the story. Rated 4 out of 5 by rjester from Loved it! High praise for this wonderful HOG series! The second installment was even better but had all the elements I liked in the first one; simple, straight to the point HOPs and puzzles, cuteness and nice art. I like simply games like this, reminds me of Dark Tales (one of my favourites). Rated 4 out of 5 by Polisuco from Great, entertaining game with amazing artwork. Nothing new, though. I only played a bit of the first "Witches' Legacy" game, and, unfortunately, I didn't liked it. It had beautiful graphics, but the uninteresting storyline and the live-action totally pushed me off. Maybe I'll try it again someday... However, this second installment in the series, "Lair of the Witch Queen" was a pleasant surprise. Not only the live-action is now gone, but the graphics and the artwork have improved amazingly, and the game has a lot for you to do and collect. The gameplay moves very swiftly, and although it's nothing new, it's pleasant. The storyline in this game, however, didn't interest me very much, either. I guess evil witches were never my cup of tea... Pros: - Unbelievably beautiful and crisp graphics. One of the best in casual gaming, no diggity. The characters artwork is one of the best I've ever seen, too. Lynn's hair flowing with the wind in the dialogue scenes is amazing to watch. The locations are beautiful, too, especially the main square of Rothenburg with those beautiful statues; - Marvelous animations. The snow falling in the city is just magnificent; - Nice, unobtrusive music and great sound effects, especially the thunder and rain in the Other World; - The voice-overs were nice overall, except Lynn's. - Your little helper, the Imp is so cute it hurts. His animations are very well made, too. A wonderful and fun addition; - Nice, relaxing gameplay. Typical, but nice, nonetheless; - Lots of extras! Lots of stuff to collect which is always fun; - The hidden objects scenes were beautiful and crisp, too, although some objects were a bit hard to spot; - The bonus chapter had the right lenght and showed some new locations. It was nice, overall, but once again you had to defeat the witch...; Cons: - Typical storyline. Insert tags here: "evil witch", "someone wants revenge", "someone's missing", "teen angst" and so on. Hey I forgot the universal one! "Good vs Evil". It doesn't get any more typical than this. Sometimes, it works well, even if it has been used a zillion times, but this time it didn't conviced or interested me; - Hey, blame me for being picky all you want but I just hate this game's cursor. I just do. I hate it. In a beautiful game like this they could have done a loooooot better. I mean it; And I think that's it. Play it and love it for what it is. A casual game. Beautiful and very entertaining with great extras and artwork, and a filler storyline. At the end of the day, it's nothing new. But great, nonetheless, have no doubt about it! Rated 4 out of 5 by Polrev from Witches’ Legacy is back Wow, fantastic HOPA with lovely gameplay, touching story, mind-boggling puzzles and HOS and this amiable imp. I can’t but mention the difficulty modes with a special custom mode to adjust click penalty, sparkles and hint. Applause to sound presentation: seems to be the best of all the games I have played lately.